2. Star Tribune (above). 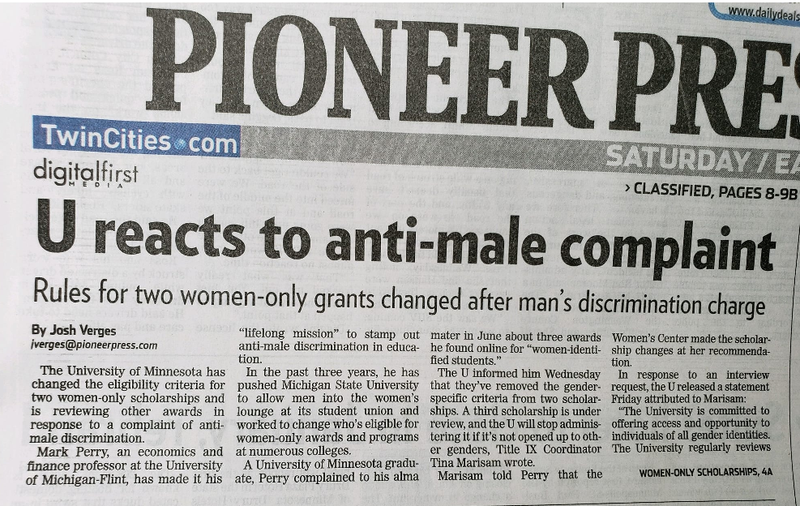 I made the front page (top of the fold) of the B section in today’s edition of my other hometown paper in the Twin Cities in a Star Tribune article titled “U alum’s challenge of women-only opportunities on campus ignites debate.” The article is about my efforts to advance true gender equity in higher education and end the systematic, ongoing gender discrimination that exists at most American universities today. Over the last month, I’ve filed more than 20 Title IX complaints against universities that offer discriminatory single-gender, girl-only STEM programs, without offering comparable single-gender, boy-only STEM programs. These girl-only programs discriminate based on gender, they exclude some students from participation in those programs based on gender, and they deny some students from the benefits of those programs based on gender, which therefore violate Title IX. In contrast, some universities like Oakland University (public university in Michigan near Detroit with 20,000 students) offer dozens of summer STEM programs and camps that are gender-neutral and gender-blind. At this Oakland University Outreach Program website, you’ll see that they offer 35 summer STEM programs in a wide variety of subjects including additive manufacturing, alternative energy, general engineering, analog/digital circuits, coding I and II, mechanical engineering, microprocessor programming, robotics, bio-engineering, chemical engineering, race car design I and II, analytical/critical thinking I and II, algebra I and II, geometry, and pre-algebra. Note that the only word that appears in the program descriptions is “student,” and the words “gender,” “boy” and “girl” never appear. The only restriction on eligibility is by grade level, and OU offers separate programs for Elementary School students (grades 3-5), Middle School students (grades 6-8) and High School students (grades 9-12). If universities are really serious about promoting and advancing the obsessively emphasized principles of diversity, equity, fairness, justice, equal opportunity, and inclusion, then they should view Oakland University as the ideal, apotheosis and gold standard of gender equity and gender equality for STEM outreach programs that are gender-blind and gender-neutral. Bottom Line: My guiding principle, which I hope would be a guiding principle of more Title IX offices in higher education, is this: “You cannot be totally committed to gender equity sometimes.” We simply cannot and should not tolerate an educational system that actively promotes the Animal House principle that all gender identities are equal in theory, but one gender is more than equal than all other gender identities in practice, e.g., single-gender, female-only scholarships, awards, fellowships, camps, clubs, programs, student spaces, initiatives, funding, etc. And now with the growing armies of diversity bureaucrats (“diversicrats”) in higher education, there are more resources than ever before to monitor gender discrimination. 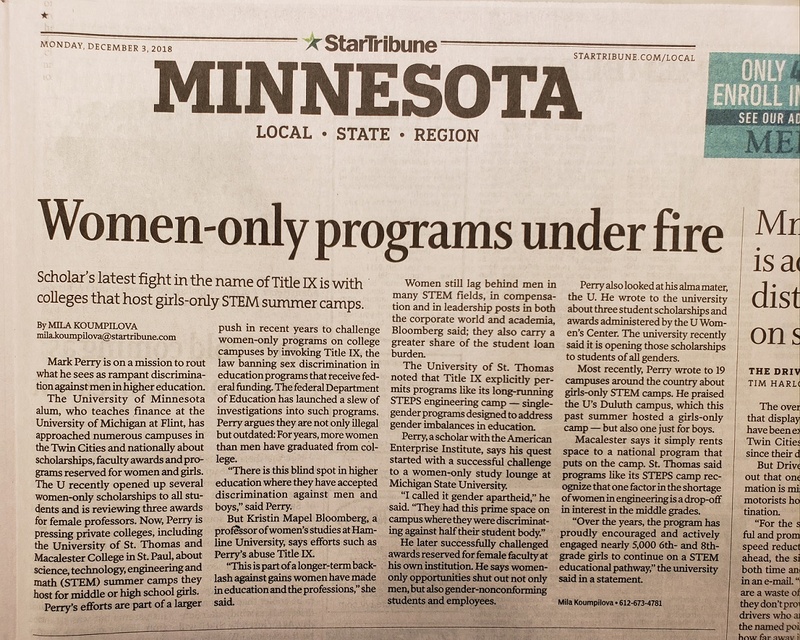 So there’s really no excuse for the ongoing and systematic gender discrimination that takes place regularly at almost every college in America, including the hundreds, possibly thousands of single-gender, girl-only STEM programs and camps.